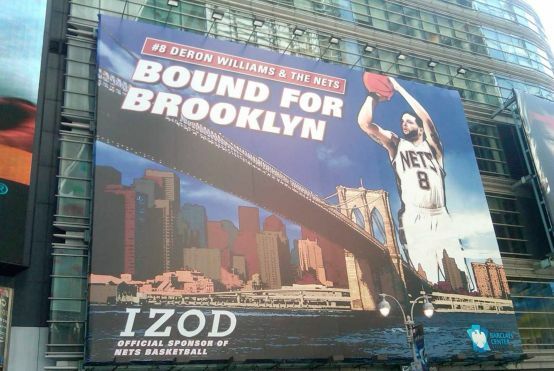 The Great Knicks-Nets Billboard War continues: The Nets today unveiled the Times Square billboard you see here, reminding people that they'll be moving to Brooklyn. (Their Atlantic Yards arena, as you surely knew already, is scheduled to open in 2012.) Of course, whether Deron Williams will actually be on the Nets by the time that happens very much remains to be seen: He's due $17.8 million in 2012–13, but he can opt out of his contract after the 2011–12 season. The Nets can begin negotiating with him on an extension beginning on July 18 (assuming the league's labor situation doesn't push that date back). Though by slapping his face on a billboard — on this billboard — it's clear they're not lacking in confidence.